Narcissists are ALWAYS HYPING AND SELLING the narc kool aid. Not a breath is ‘wasted’ on other things, like OTHER PEOPLE or events in life…no the narcissist is a living breathing walking PR campaign and self advertisement about just how, well…..”GREAT THEY ARE”. We thinks thou doth protest just a bit TOO MUCH, narcissist. Think about this from a normal person’s standpoint for a moment. Do you sell yourself everyday? Do you try to get people to like you? Agree with you? Go to bat for you? Fight your battles? Do you try to convince people that you’re nice? A christian? Loving? A good friend? Or best wife/husband around? It’s actually exhausting just thinking about living this way. Imagine feeling that you have to be ON 24/7 just to feel “ok”. As a (low maintenance) female, Im lucky if I actually wear makeup once a month. When our time is spent LIVING life, focusing on happiness and joy, and experiencing connection and contribution, we really don’t have time to SELL OURSELVES. So let’s think about this. What are they SELLING ANYWAY? They’re selling us on their IMAGE. That image is their FALSE SELF. The unreal, imaginary, wishful mask that they dream they could be. If it were genuine, they’d just relax, live, be and let be. But because it’s hype, well they have a pressing need to HYPE it and boy do they. Go to any narcissists social media roll and there in plain sight you’ll see the diatribe of narcissism. While those of us who are skilled at detecting the attention getting needs and schemes of a personality disordered narcissist, there are many sheep just milling the earth looking for something false to worship and a narcissist looks like a shiny gamble. Former targets just want to yell to these sheep, “Wake up! It’s a rouse! This isn’t real! This person is NOT who they’re pretending to be. They’re a wolf in sheep’s clothing. They’re a danger.” But these lost souls have been found when a narcissist sweeps them up into their minion fold and gives them a “purpose”: Kool Aid Consumer & Narcissist defender. The kool aid drinkers don’t listen to wise men. They keep drinking their kool aid, fighting the narcs battles when called upon, and unbeknownst to them, looking foolish and obtuse to the rest of us. It angers targets to see people behave so foolishly. The narcissist is in desperate need of the kool aid drinkers, for without them, they literally DONT EXIST. A narc needs an audience, fan club, minions, flying monkeys and kool aid drinkers to survive. Without someone telling them how good they are, how giving and loving they are, they would implode in on themselves with shame and self loathing. That’s the REAL narcissist. Take away the kool aid, and all you have is a person with a mental disorder, who hates themselves, pretends to be somebody good, someone they’re not, who uses and abuses people, including their own families and children and who is so full of themselves and worldly matters that they are hopelessly void of anything good or Godly. The narcissist sells kool aid and is so overly insistent about something about themselves to the point where we realize the opposite is most likely true. REAL NARC The charm is contrived. The slick and verbal facile ability is actually the ability to flatter others to get what they want. The charm is in this case a means to an end. An agenda. Charm like this, is NOT alluring or attractive, in fact it’s a snare to your future abuse. If you want to avoid this real narc’s scheme, don’t fall for the charm. In fact, let Charm equate to a red flag that this person is TOO SLICK for your good sense. Good, Altruistic, Giving, Charitable, Public persona, Christian, etc. REAL NARC As a study of good people (those they exploit and will identity thieve) real narcs learn who to mimic and why. They know that good people are trusted, respected and get the rewards of society. Real narcs want to appear as if they’re these people so they spend a great deal of time broadcasting and showcasing (selling) their “good guy” or “saintly girl” image. Of course, the narc is nothing like the people they pretend to be. They are hypocrites. Painting themselves in a charitable light, while stealing others identities, reputations, ideas, and peace through abuse, scheming, manipulation, power and control is NOTHING charitable good or christian. In fact, those behaviors are on the list of 7 things God Hates. Yes, God hates narcissism. But the narcissist gets a lot of kool aid miles out of pretending to be a good person. They wouldn’t even begin to be able to start the process of being a good person because good people have humble hearts. Those who are truly charitable don’t take pictures of themselves and design a big PR campaign around being charitable. God calls that behavior out too in the bible: Give in secret. Don’t make a big show of it. The victim. Oh boy do these people LOVE to wear the victim label. All of us who have been truly victimized, can relate to how much we honestly DETEST using the victim label to describe ourselves. Its a reason we use the term TARGET in our community. Not narcissists however, they want to look like the Poor, sorry, victim who nobody understands, everyone picks on even though they’re doing such good work (just look at their timelines), the guy who’s just trying to get along, or the girl who has so many haters (pooooor narcissist). Who in their right minds thinks that other people complaining about how cruel they are would switch it around to being a “hater”? Narcissists that’s who. They are always the center of some triangle or drama (that they created) but can’t take any responsibility for getting themselves there but they’re the first one to take to social media and enlist their flying monkeys on a campaign to slay the messenger (whoever confronted the narcissist honestly about a negative characteristic). They have endless stories about fights in the community, with bosses, with some imaginary enemy that’s persecuting them. Oye. The truth is, the REAL narcissist is NO VICTIM AT ALL. They’re the perpetrator dressed in victim clothing. They seek targets. They have agendas. They have impure motives. They use people. They abuse people and when they’re done, they unceremoniously discard people like trash. They slander people. They sic their flying monkeys on detractors and complainers and they sow discord wherever they go. They have a REAL reputation following them, with a target list a mile long, and all those kool aid drinkers don’t have any clue it exists. The real narc lives in an imaginary fantasy world of “perfect” and have a clueless sheeple fan club to maintain their delusions. People that weren’t hiding anything wouldn’t need to go get their bully gang when anyone insults them. They’d stay strong in who they really are (a firm identity) and behave with character to have an honest conversation about the complaint. The real narc cannot do this! They run! The last time I saw my abuser…that’s what he was doing….RUNNING…in the court hall….away from the group of 30 people who just told the truth about him to a judge. Ill NEVER get that image of cowardliness of the running narcissist out of my mind. That’s what REAL NARCS do…they RUN from those who aren’t drinking the kool aid. Loving. A person who appears to be sensitive, soft, vulnerable, insecure, kind, and loving. Evil. Im serious about this. Dead serious. The many many things I’ve learned about narcissists unfortunately keep pointing me back to the word that describes them best: EVIL. Why I would call another human being this horrible word is sometimes shocking to me, as I’ve never done that. With a narcissist however, I feel that the bible (my own personal opinion) has given me clear clear guidance as to who a narcissist REALLY is. When God kicked satan out of heaven, it was because he wanted to exalt himself (play God) and be equal to God. Whether or not you believe the bible is irrelevant, what remains true is this: a narcissist is grandiose. They believe themselves the ultimate power. If you can’t humble yourself and understand that you aren’t the best thing going in this world, you CAN’T love other people, period. The narcissist does not possess boundaries. Others have purposes to the narcissist that in their eyes, cause them to exist FOR the narcissist. They are extensions of him. A new “friend” is not a “friend” in the conventional sense of the word to a narcissist, they are a person who is of good USE. The friend may have contacts, look good, or know high status people. The friend may be talented or be a truly good person, but to a narcissist they have a purpose for use. A person who approaches someone with an agenda cannot love them, not even for the use they serve. You think, but they love their kids right? They say it all the time. NO! 1) Their kids are extensions. Mirrors. If the kid is doing great things, the narcissist is pleased at how this makes them look being their parent. Their kids future allows the narcissist to imagine their own immortality. For the narcissist will “live on” through their kids, and their kids and so on. 2) The things that narcissists can do behind their kids backs and to their spouse is evidence that the love doesn’t exist, because how could you purposefully do damage to your children without feeling empathy due to the love you have for them? Many loving parents STOP BAD BEHAVIOR because of their kids. They’ll stop cussing, smoking, having drinks in the house, carousing, etc. Because they don’t want their kids to witness this bad behavior. NOt a narcissist. They’ll keep on sinning, believing delusionally that “it doesn’t affect the kids”. Oh yes, it does, and we’re ALL witness to it narcissist. When you love yourself, accountability and responsibility are HUGE components. We accept our imperfections, we admit them, we apologize when we hurt others. They lack a conscience and they lack empathy. Its more important to a narcissist to remain blameless than to admit how deeply wrong they were and how much they hurt others. Not true with a narcissist this, humility is not in their “house of cards” – and thus, they can’t be humble enough to care for others. They remain isolated in their big perfect mess of an identity while blaming and shaming others for this gap. If you take anything away from this message, PLEASE, when being offered a glass of narcissistic kool aid, JUST SAY NO! 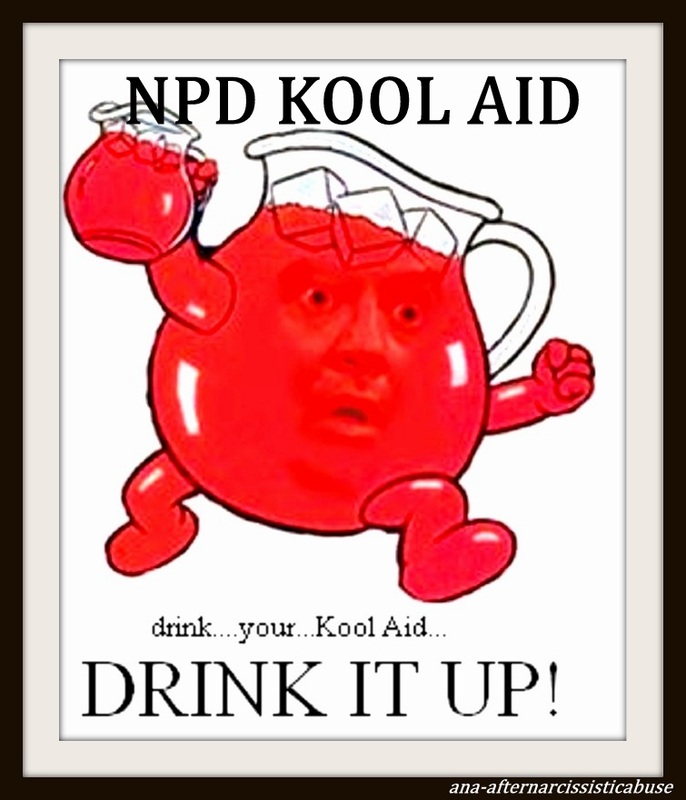 Hah, kool aid – I wish it were so easily avoided! Hi Emma, this was quite a piece! It has the feel of a rush of words fighting to get on the page. Did it feel like that? Emma I’m off to bed soon but I just wanted to say I will be reading and re reading, there are parts that make me uncomfortable, there’s character traits I recognise in others, I enjoyed reading and a lot to think about.